Having a criminal minded child in a family that hasn’t committed any crime in generations is an interesting idea and can make for a great film. After all, our upbringing plays a major role in shaping our personalities but sometimes, it’s the experiences that one goes through that also has an impact. Hansal Mehta, known for attempting novel topics, takes up this challenge and comes up with SIMRAN. That it’s inspired from a true incident increase curiosity levels too. So does Hansal Mehta manage to do justice to this unconventional plot or does it go haywire, let’s analyse. SIMRAN is the story of a girl with flaws who has to resort to crime when things go horribly wrong. Praful Patel (Kangana Ranaut) is divorced and is living in Atlanta in United States of America. Fed up with the rants of her parents (Hiten Kumar, Kishori Shahane), she decides to move into her own house. She even gets pre approval for her loan. A chance visit to Las Vegas with her cousin Amber changes her life. After initial victory at the casino, she loses lot of money, including her savings. Yet, she continues to play since she gets addicted to it. A private moneylender loans her $32,000 and she loses that as well. The moneylender is dangerous and warns her of dire consequences if Praful doesn’t repay the amount along with interest. With no other option, Praful starts robbing banks. How it messes her life further forms the rest of the film. The story penned by Apurva Asrani which has been inspired from a true incident rests on a weak pivot. Apurva Asrani’s screenplay is very faulty and incoherent. There is no relatability factor of any sort with the principle protagonist and that goes against the film heavily. Apurva Asrani’s dialogues [additional dialogues by Kangana Ranaut] are fine however but nothing memorable. Hansal Mehta's direction is disappointing and it’s nowhere close to his earlier films like SHAHID, CITYLIGHT and ALIGARH. Few scenes have been well executed by him though. Watch out for the scene where Praful's father watches the news and criticizes the father of Simran, not realising that he is insulting himself. It is quite funny. 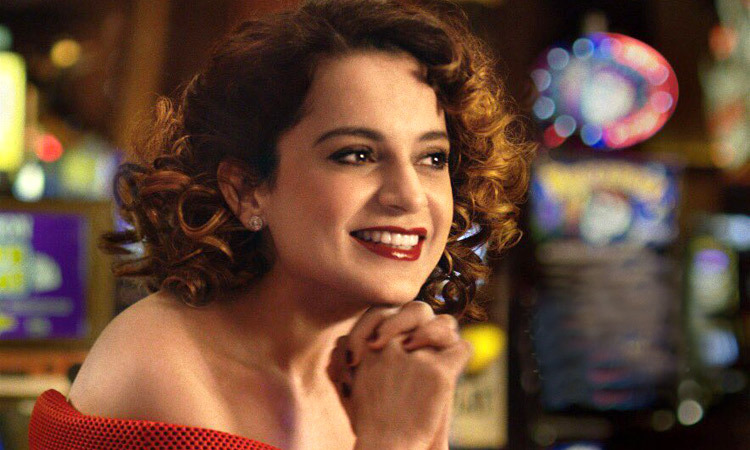 Kangana Ranaut does a good job but her performance is quite inconsistent and comes across as self-obsessed. Notice how her Gujarati accent vanishes in several scenes – such goofs are not something that we expect from a powerhouse performer like her. Sohum Shah's (Sameer) performance suffers because his character isn’t well fleshed out. He disappears completely in the middle of the film. Hiten Kumar is too loud and theatrical. He should have kept his performance restrained. Kishori Shahane is quite better. Esha Tewari (Salma) is fine in her small role. The actors playing Amber, Mike, bartender, moneylender and his henchmen are fair. Sachin-Jigar’s music is forgettable overall. The title song is the only one that registers. ‘Lagdi Hai Thaai', ‘Pinjra Tod Ke', 'Meet' and ‘Majaa Ni Life' aren’t memorable. Anuj Rakesh Dhawan's cinematography is satisfactory. Tiya Tejpal’s production design is nothing special. Antara Lahiri’s editing is not great but with such kind of script and direction, there is nothing she could have done. On the whole, SIMRAN is a movie which can be easily skipped without any regrets. At the box office, it will turn out to be an average fare. Watch it only if you are a Kangana Ranaut fan.